Denver now launches, its very new, Denver Black Code Deodorant, which sets you apart from the crowd with a bold and alluring fragrance. Additional Information: Denver offers a range of wide products like deodorants, perfumes, haircare and skin care, which are specially designed for men giving them a lasting redolence and replenishing sense of purification and liveliness. Denver Black Code Deodorant offers you an extraordinary perfume giving you a remarkable confidence. 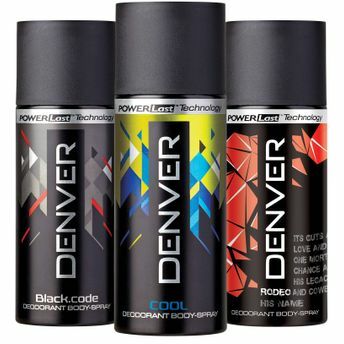 Denver now launches, its very new, Denver Rodeo Deodorant, which sets you apart from the crowd with its vibrant and aesthetic aura. This aromatic flavor invigorates your senses making you feel radiantly fresh. The scents of this deo-spray drive away the foul body odor and refresh you. Additional Information: Denver offers a range of wide products like deodorants, perfumes, haircare and skin care, which are specially designed for men giving them a lasting redolence and replenishing sense of purification and liveliness. Denver Rodeo Deodorant offers an extraordinary fragrance giving you a remarkable confidence.